(Nanowerk News) Nanoparticles hold great promise for cancer diagnostics and therapies, but only to the extent that they can be selectively guided to tumors and cancer cells. Leading a multidisciplinary group from Dartmouth College, Karl E. Griswold, PhD published, "Antibody-mediated targeting of iron oxide nanoparticles to the Folate receptor alpha increases tumor cell association in vitro and in vivo" in the International Journal of Nanomedicine, which follows closely the publication of "Tumor Cell Targeting by Iron Oxide Nanoparticles Is Dominated by Different Factors In Vitro versus In Vivo" published in PLOS ONE. "The ultimate utility of anti-cancer nanoparticle technologies will depend in large part on their capacity to selectively home to cancer cells," explained Griswold. "Achieving optimal targeting of nanoparticles in clinically relevant scenarios remains a key challenge for researchers in this space." In this image, taken at 25,000x magnification with an electron microscope, antibody-targeted iron oxide nanoparticles can be seen binding to the surface of a human ovarian cancer cell. The in vivo environment is enormously complex, and there exists an extensive array of variables that determine distribution and cellular targeting of nanoparticles in the body. Homing of nanoparticles to tumors is dependent upon parameters such as nanoparticle size and composition, molecular targeting, surface chemistry, route of administration, cancer cell type, and tumor location. Using carefully designed and rigorously validated functional nanomaterials, the Dartmouth team pursued a systematic study of those variables in xenograft models of both breast and ovarian human cancers. The in vivo studies showed that antibody targeted iron oxide nanoparticles accumulated in tumor tissues following systemic administration, whereas non-targeted nanoparticles failed to show any detectable tumor association. Importantly, molecular targeting not only localized nanoparticles to tumor masses, but it also resulted in nanoparticle internalization by the cancer cells at a microscopic level. 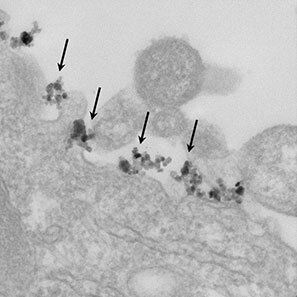 "This ability to accumulate iron oxide nanoparticles within cancerous cells following systemic administration has important implications for diagnostic and therapeutic applications of this particular type of magnetic nanomaterial," said Griswold. The multidisciplinary Dartmouth studies utilized a broad variety of Dartmouth's Shared Resources for scientific investigation including the Dartmouth Transgenic and Genetic Construct Shared Resource; the Dartmouth Electron Microscope Facility; the Dartmouth Center for Cancer Nanotechnology Excellence, Toxicology, Biodistribution, and Pathology Core; the Dartmouth Trace Element Core; and the Dartmouth-Hitchcock Norris Cotton Cancer Center Pathology Translational Research Core. All of the Dartmouth Cores and Shared Resources are open to outside investigators by arrangement. "In studying cancer at Dartmouth, we are committed to team science," said Griswold. "Solutions to problems like these require transdisciplinary collaborations operating at the complex interfaces between molecular biotechnology, nanotechnology, biology, and medicine." Looking forward, the researchers are in the final stages of follow-up work synthesizing and characterizing more sophisticated iron oxide nanoparticles that are more capable of targeting the inherent heterogeneity of cell surface markers in tumor microenvironments.